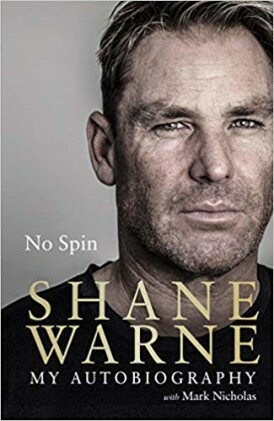 There have been a number of books written about Shane Warne, at least three of them biographies in which the subject had no input. That said there was a book entitled My Autobiography published by Hodder and Stoughton in 2001, so my curiosity was aroused by the statement on the dust jacket of No Spin that the real story has remained untold. Having read the earlier book I probably wouldn’t have bothered to read No Spin without that comment, well not all of it anyway, but in light of it I thought I had better have a read. Like many Englishmen my views about Warne have changed over the years. I took an instant dislike to the blond leg spinner who took that wicket at Old Trafford in 1993. His various scrapes after that, most notably his errors of judgment with an Indian bookmaker and a diuretic pill, did nothing to change that. It was 2005 before I started to look at him in a different light when, two decades on, the urn finally came home after the most exhilarating Ashes series of them all. It cannot have been easy for Warne to be as generous as he was in defeat, something which of itself deserved respect. The contribution he had made to that remarkable series with 40 wickets and 249 runs was also compelling, as was the manner in which his scalps were collected. And then there was Hampshire. Not too many Australians have ever had a lengthy stay with an English county. It may have been that my volte face in relation to Warne would have taken place five years before it did had he signed for Lancashire, as he explains he nearly did at the turn of the millennium. At the time that story passed me by, but what could escape no one was the extent of the commitment Warne showed to Hampshire, particularly the three years during which he captained the side. His account of his time in the county game and in particular a Championship fixture with Nottinghamshire in that 2005 summer, when he could have been excused from county duty, is a highlight of the book. The concern I had about No Spin was the extent to which it would add anything to what I already knew of Warne a man who, let’s face it, has never shied away from publicity and whose life has often been paraded in newsprint, and as frequently on the front page as the back. My initial approach was that despite the blurb nothing up until 2001 was going to add a great deal to anything I had read before about Warne. What I wanted to read was the second part of his story, and to see what he had to say about the episode with the Indian bookmaker, the one part of his history I was quite content to believe might not have been fully dealt with in his earlier book when, after all, he was still planning to be playing the game for a few more years. In fact Warne’s account of his dealings with ‘John’ the bookmaker in 1994 is essentially unchanged from that he gave in 2001. There were a few differences in matters of detail, and overall Warne’s defence of his position, this time from the pen of Mark Nicholas rather than that of Richard Hobson was, if anything, even more strident and, unlike in 2001, he makes no mention of the suggestion that the Australian players had been warned by Bob Simpson in a meeting of the dangers of accepting generosity from ‘supporters’. In 2001 Warne’s position on that one was that by the end of team meetings he had often stopped taking in what was said. In 2018 there is simply no mention. Personally I’ve always been of the view that Warne was guilty of nothing more than being naïve, but the lack of any real contrition is interesting, particularly given that back in 2001 he was prepared to take a helping of humble pie. His views have clearly hardened, no doubt in part because his cricket career is now behind him and he couldn’t give the proverbial tuppenny toss about what Cricket Australia think of him, but doubtless also because of subsequent experiences with adverse publicity. As it had taken Warne out of the game for twelve months I did recall the ‘diuretic’ incident which slapped a drugs ban on him back in 2003. I must have known something about the incident at the time as I recall thinking the punishment was harsh, but it wasn’t something I dwelt on. What is clear from No Spin is that there is a good deal of lingering resentment about the way Warne was treated, and not without good cause. His explanation for why the drug Moduretic was in that sample might not have cut any ice with some, but the fact that the drug is no longer on the banned list puts what occurred firmly in context. Something I didn’t know before picking up No Spin was that Warne spent his ‘year off’ setting up a charity, the Shane Warne Foundation, using $50,000 of his own money. In the circumstances it had also escaped my attention that, an investigative journalist having made allegations of financial mismanagement to start the ball rolling, the charity had to close in 2016. Once more Warne is unhappy at what happened, and who can blame him. It is clear that his charity did a lot of good work and, given that the relevant regulator was satisfied with the accounts it saw, once more I was left feeling considerable sympathy for Warne. It is aspects of his life such as those to which I have made reference that make a book about Warne worth reading. The simple truth is that he has led an interesting life both on and off the field. Personally I’m really not too bothered about his private life and am quite happy to leave him to it where that’s concerned, but then if he will decide to have a relationship with a lady who is pretty much the most famous English actress of her generation constant intrusions from the press are, I’m afraid, something that will inevitably become a fact of life. That what he says in No Spin about his love life is the whole unburnished truth is something I am sceptical about, but for anyone who is interested in that I suspect they get most of the picture. Warne on the IPL is an interesting topic, as is Warne on teammates and opponents. In that respect I think he might have said more, but then he has already given his name to a book about his hundred best players, so I see why he has chosen not to repeat himself. As it is No Spin is a book that could easily have been at least as bulky as those that faithfully record the lives of Messrs Waugh (S), Gilchrist and Ponting, but thanks to Mark Nicholas it isn’t, and whilst not all of it is for everyone it is an engrossing read on the subject of one cricket’s very few genuine superstars.